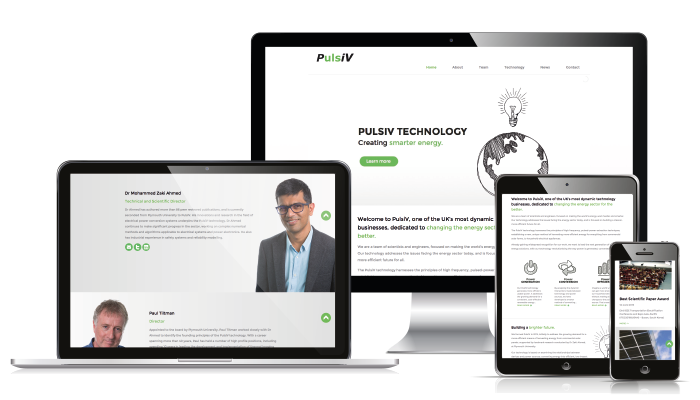 PulsiV is a team of scientists and engineers focused on making the world’s energy work smarter and harder. Its technology addresses the issues facing the world’s energy sector, establishing a unique method of harvesting energy for everything from commercial solar farms, to household electrical appliances. The team wanted to raise their profile to reach new investors, as well as potential future customers. They briefed Formedia with the task of building a website which was both informative and visually appealing, whilst turning highly technical subject matter into easily understandable copy. After an initial brainstorm with the PulsiV team, we mapped out the overall concept of the website, highlighting the need for simple navigation. We eventually settled on a monochromatic colour scheme, with splashes of green to represent the core eco-friendly values of the company. A further interview with the PulsiV team, helped to ensure that our copy writers were familiar with the complex science underpinning the revolutionary technology. With the vision created by our designer, the copy written by our PR team and the site built by our developer, the result is a shining example of Formedia’s integrated approach to projects. The illustrative style of the images juxtaposes with the extreme science behind the technology – making a complex subject matter appear less threatening. By utilising our strong copywriting skills, we turned scientific jargon, into digestible and engaging information.